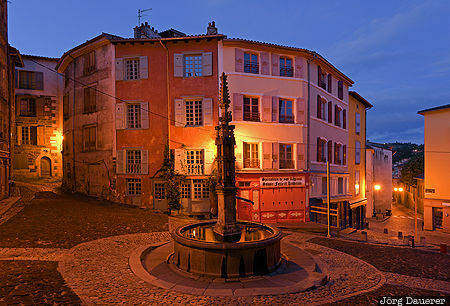 A small square with a well in the center of Le Puy-en-Velay illuminated by street light at the blue hour before sunrise. Le Puy-en-Velay is in Auvergne in the center of France. This photo was taken in the morning of a cloudy day in September of 2015. This photo was taken with a digital camera.